An old friend of mine recently sent me this photo from the last time I guided in the annual Redbone SLAM tournament down in Key West. This was from 2003, back when my three-day beard still grew in dark instead of pure grey. 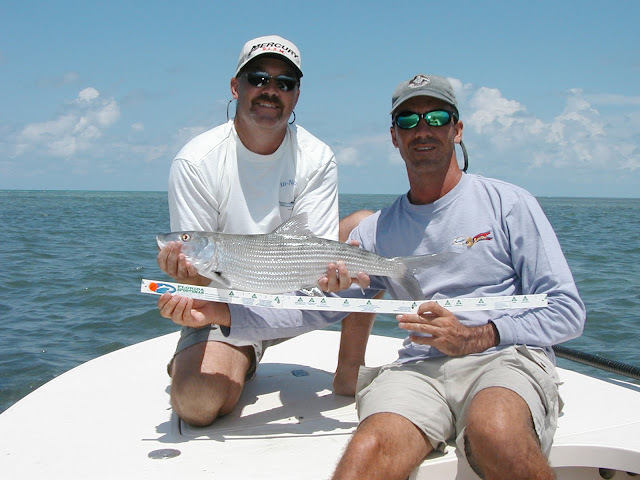 The angler was Ned Hammond and his 8 pound bonefish was the second largest caught in the tournament that year. We missed the trophy by two inches. The Redbone is a great series of tournaments that benefit cystic fibrosis research. They originated in the Keys and are now held throughout the US and are covered by ESPN. I always enjoyed fishing them for both the competitive aspect and also for the chance to rub elbows with some of the most well known names in angling. The Redbone also boasts several celebrity participants including the "Big Man" Clarence Clemons from the E-Street Band. Big Man would often jump on stage with the band at the Schooner Warf bar for several sets after the awards banquets. That was always a real highlight for everyone down there. They have a great website and you can find a tournament near you by clicking here.